In some ways Akram Khan is no longer a guest to our shores as he tours regularly, spoiling Australian dance audiences. On his most recent visit he presented a new work, Gnosis, at Sydney’s Opera House. Gnosis meaning, ‘in the knowledge’ was an evening of dance that combined Khan’s love of traditional Indian dance with contemporary dance, inspired by Gandhari, a female mythical character. The program was split, with the first work performed in the traditional North Indian dance style of Kathak. 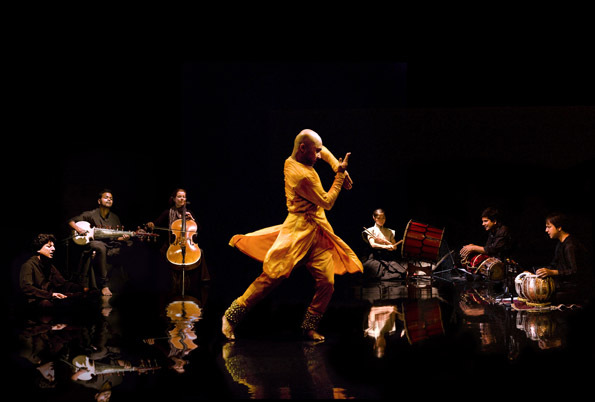 A small group of highly skilled musicians accompanied Khan throughout the piece and were as much a highlight of the performance as Khan’s unique choreography and flare. The choreography was fast paced and intricate, with many detailed minute movements throughout the upper body and very quick foot work. Khan showed us his finely tuned Kathak skills, speed and precision. This part of the evening was definitely a crowd pleaser for Sydney’s Indian community who packed the theatre. The stage was very bare and the lighting was too simple, in my opinion. 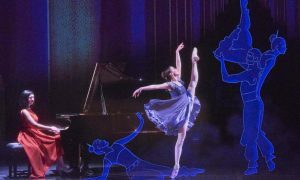 Use of more contemporary style lighting would have definitely added to the presentation of the work without detracting from the intent of the choreography. The second work was a contemporary piece, but it still displayed Khan’s roots in traditional Indian dance. The choreography was full of emotion with a female dancer playing a blind woman. There was a unique bond formed between the two dancers through the characterisation and the choreography, and we were taken on an emotional journey. Once again there was so much detail in each movement. The movements were performed in perfect synchronization with the music and the sheer speed and clarity of the choreography was quite intense. Khan’s incredible technical skills once again shone. The chainé like movements he performed were ridiculously fast and he danced them in a circle with ease. I was more than impressed. The second work showed a simplistic beauty and was breathtaking. Both works choreographed by Khan were so intimate that I believe they would have communicated better in one of the smaller theatres at the Opera House. The musicians performing on stage gave Gnosis an acoustic feel and it would have been enhanced in a smaller theatre, as the musicians were so far from the audience. Khan definitely has a very unique choreographic voice and has something very special to share. His Indian dance style sways ever so nicely into contemporary movement and he is able to gel the two together to create something very original. I was able to appreciate both sides to Khan’s training and was impressed by the style in his contemporary choreography. The whole evening was a treat and was very well received by the audience.